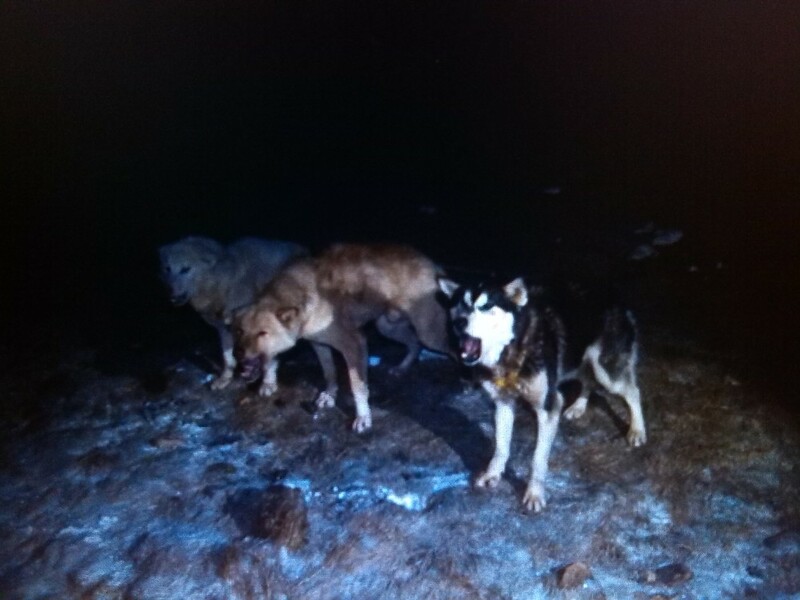 A necessary anarchy reigns in the Dark Ice dog teams as potential king (alpha) dogs are usurped by unlikely challengers and stubborn loners refuse to submit to authority. It's an unfortunate fact that Greenland dogs fight. They growl, tussle and bite each other to establish dominance. Sometimes one party will submit early on and violence will be avoided. When each dog enters the encounter with tail raised however, at least a scuffle is inevitable. It is essential for a well-functioning dog team that an established hierarchy of dominance exists. With this in mind we have begun a series of introductions amongst our dogs, allowing strangers to get acquainted. It isn't easy to predict the results! Houdini, our cocky, near year old escapologist is now lording it over two dogs four times his age. As one of our least experienced sledge dogs, how his confidence carries into a full ten dog team will be key. Anders' favourite, Thor, was the latest to run a short gauntlet of potential team-mates. In a somewhat mixed bag he, a sturdy 'Thule dog', maintained the hoped-for dominance over Odin FKAT and an as-yet-unnamed male from Siorapaluk but had to be satisfied with a snarling match with Enrique. He and OJ conspired simply to ignore each other before Alex had to step in to prevent LBD (little black dog) from winning a physical confrontation too convincingly. In a bid to make sense of it all and aid our efforts to put together functional teams we are recording all of this into an ethogram (of the type Alex devised for his university wolf studies). This matrix of encounters notes the dominant dog, relative tail positions and the extent of any disagreements. Of course, we don't see many local hunters making similar tables (!) but we are certainly finding it a useful way of keeping track of which dogs are particularly calm or confrontational. We hope to begin work on the actual sledges in the next few days under the much appreciated and watchful eye of Rasmus, our sledging mentor and fixer for our dog purchases. The current plan is for him to walk us through the first sledge, using a complex array of lashings and reinforcements, then leave us to work away at a second by ourselves. Away from dog related news, we enjoyed a very festive evening on Christmas Day (24th rather than 25th here) with a local family, two teachers from the local school and the settlement's nurse. After as good a Christmas dinner as I've ever had, singing in four languages, being amongst great company and even some surprise presents, it did a great job of banishing any twinges of pining for home and normality. That's all for today; more soon from Alex on our developing relationship with the dark and general winter living in Qaanaaq.